Brasília is known as a “modern city”. Moreover, it ranks among extreme examples of top-down designed settlements. Still, the city underwent transformations over time, becoming less “pure”. They have been mainly in modes of appropriation of space rather than changes in its physical structure, but the latter have also happened. 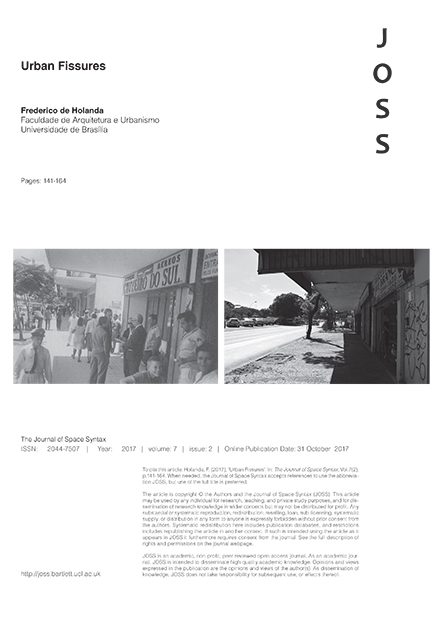 The paper addresses the issue of “spatial subcultures” – fissures – that have emerged in the interstices of the dominant order, as well as the reaction of the latter to the appearance of the former. “Spatial culture” is addressed in the widest sense, concerning both social production and social reproduction. Modernist urban design has been assessed as non-amicable to public appropriation of places. In Brasília this concerns e.g. the vastness of open spaces, particularly in the more symbolic parts of the city, in which culture as social reproduction has been projected on the ground as a reflection of ideological and political values/functions. However, this problem is also a great asset, as the availability of open spaces has been exploited as a resource for implementing unforeseen activities. The myth of deserted spaces is contradicted by both formal occasions (political rallies, religious celebrations) and informal ones – swarming of people at leisure in streets closed to traffic on week-ends. In closed spaces, this takes the form of land use changes. In both cases, the move is towards more instrumental and more popular appropriation of places, in contrast with the expressive and elitist determinations of the norm. Changes are not devoid of tensions, which reflect contradictory viewpoints over the city – civil society vs. the State, or between diverging social classes’ interests.